The holiday deals have already started. And shoppers are feeling especially giving this season. Consumers plan to spend just over $1,000 during the holidays, up 4.1 percent from the $967 they said they’d spend last year, according to the National Retail Federation’s annual survey. Jenna Veach, operations assistant at Dupaco Community Credit Union’s Pennsylvania Avenue branch in Dubuque, Iowa, loves to shop. She especially loves to shop local to support her community. Set a budget—and stick to it. It probably won’t come as a surprise, but a budget is key to any successful spending plan. Look back at how much you’ve spent during the past few holiday seasons, and determine whether that amount is realistic and still fits into your overall budget. Make any necessary adjustments before you shop. MORE: Need help finetuning your budget? A free Dupaco Money Makeover can help! Draw names instead of gifting to everyone. As you set your holiday spending budget, it’s also a good time to review your list of gift recipients. If you’re still buying for a long list of friends and relatives, consider a gift exchange with them instead. A gift exchange allows you to spend a little more on the recipient—but still spend significantly less than you would if you were buying for several people. The holidays come the same time every year. Planning ahead for your holiday shopping gives you the opportunity to bargain hunt and wait for the “deal of the day” so you can spend less for the same item. “There are deals to be had if you’re willing to watch for them and have the time to wait for items to ship,” Veach says. Take advantage of your rewards credit card. 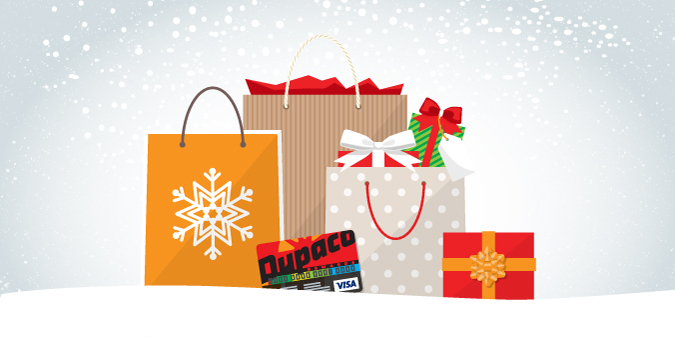 If you use a rewards credit card—such as the Dupaco Rewards Visa—you might be able to cash in on some rewards to defray your out-of-pocket expenses during this expensive time of year. Or, you’ll at least get rewarded later for making your purchases with that card. With the Dupaco Rewards Visa, you earn and redeem points—1 point for every $1 spent—for merchandise, travel, gift cards and even cash back. But before using a credit card, it’s important to know what type of spender you are, Veach cautions. Sign up for emails from your favorite stores. You’ve probably been asked before whether you’d like to sign up for a store’s loyalty program or subscribe to receive store emails. While these messages have a way of clogging up your inbox, they can provide some great discounts and let you know when sales are happening—especially if you were planning to shop there anyway. Remember the spirit of the holidays. You don’t have to spend a lot to give back to your friends, family and community during this time of year. Spend time with each other, and give from the heart, Veach says. Maybe you give a small gift but package it with a heartfelt card. Or, give the gift of an experience. If your friend or relative has young children, you could offer to babysit so the parent can enjoy a kid-free night out. MORE: Check out these four budget-friendly gift ideas from the heart. If you don’t have a Holiday Club account, now is a great time to open one for the next holiday season. You can set up automatic weekly or biweekly deposits to your account, and the balance will be automatically deposited into your checking or share savings account at the end of October. This year, Dupaco members saved a record $4.93 million through their Holiday Club accounts! MORE: Save for the holidays year-round with Dupaco’s Holiday Club savings account.